This square cafeteria table has a sleek chrome frame which complements your choice of laminate. T-mold edge banding protects the surface against bangs and scratches. 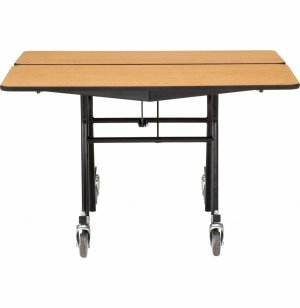 Shape up your lunchroom with these sturdy cafeteria tables from National Public Seating. With smooth mobility, easy folding and a durable build, they are a great choice for any school or business. 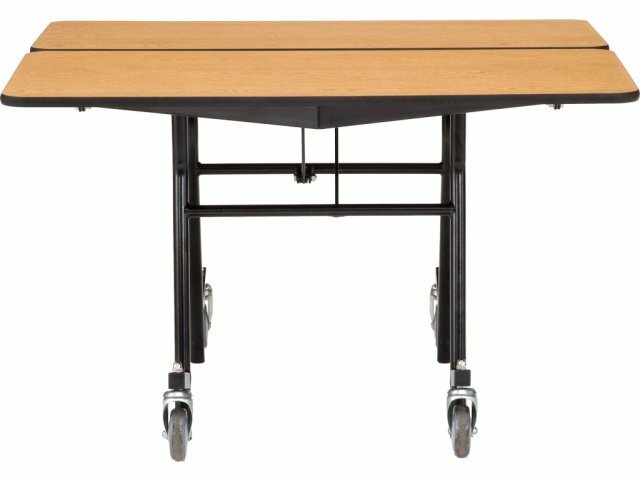 With an automatic lock in the open and closed positions, and heavy-duty casters which lift off the floor when the table is opened, you get excellent safety and stability. When you are ready to move, set up or clean up, the fold lock can be released manually from either side of the table. With all of the hustle and bustle in a school cafeteria, easy cleaning is very important. A power-washable phenolic backer, low-maintenance laminate surface and the ability to lock tables in the partially-folded position promote quick cleanup of the tables and the floor beneath them. Choose between round and square cafeteria tables in a selection of sizes and finishes.